Upon walking into The Painted Bird in Suttons Bay, you just might experience the delight of watching Carol Bawden at work weaving on her loom. The loom is Bawden’s favorite tool for creating her masterful works of art. Weaving allows her to start and stop anytime she wants, which she loves. Plus, she can chat with visitors while she works. Often, she serves as entertainment and maybe even a distraction for children and husbands who patiently wait for their shopping mothers or wives. Bawden is a fiber artist and has been creating works of art since the mid-80s. She moved to Leelanau County in 1983 and worked for a couple of years with the Glen Arbor Art Association, starting their co-op gallery in 1984. It wasn’t long before she was itching to open her own gallery. When a space in Suttons Bay was offered to her, she jumped at the chance to create a collective community to showcase not only her work, but the work of the many creative artists she had come to know and respect over the years. Repurposing old scraps of fabric given to her by many sewing friends is one of Bawden’s favorite tasks. She has shelf after shelf loaded with fabric scraps, organized by color. Back in the early ‘90s, Carol was commissioned to create a custom rug measuring 33 by 11 feet in size, made entirely from old blue jean fabric. The varying hues of blue, from very light to very dark, allowed her to create a piece that seems to ebb and flow just like the sparkling water that surrounds us all in Northern Michigan. To this day, the rug still graces the porch of its original home. Bawden takes great pride in showcasing the work of her fellow artists and says that jewelry is by far her biggest seller. She carries many fine jewelry pieces made with unique Petoskey stones, Leland Blue, beach glass, and many other cherished gems from the area. In her experience, visitors to The Painted Bird are looking for a keepsake that will forever remind them of their visit to the area or serve as a treasured gift for a loved one. Beyond jewelry, the shop offers some amazing wearable art, including clothing for women and children, hats, purses, scarves, belts, and tote bags. For those looking to redecorate or simply wanting to add a decorative piece to freshen up a room, the mix of home décor is unparalleled. Inventory includes everything from rugs and wall hangings, functional sculpture and pottery, mirrors and clocks, and items for kitchen, bath, and beyond. 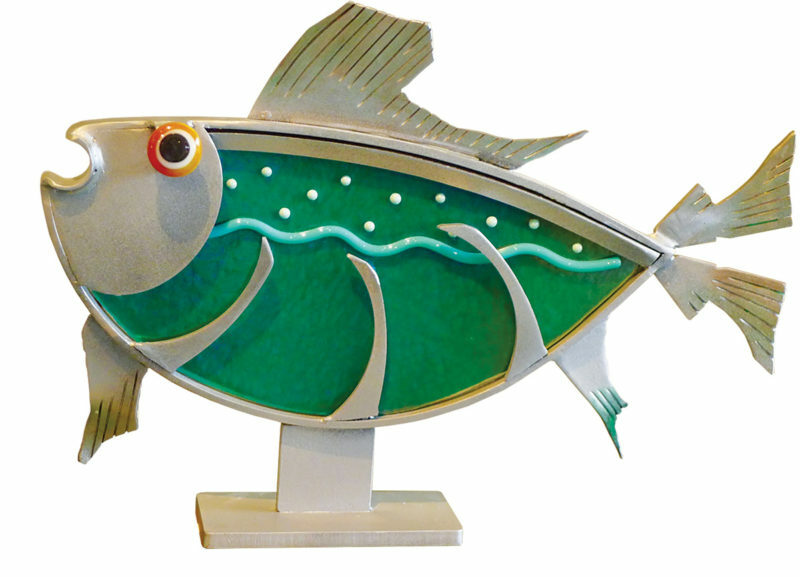 There is also a full selection of the eye-catching metal and glass sculptures by artist Kathy Kreager, who was commissioned to create an entire collection for Munson Medical Center’s Cowell Family Cancer Center in Traverse City. The collection of artists at The Painted Bird and the wares they create with love and passion will not disappoint visitors! The Painted Bird is open year-round. Stop in, and maybe you will get to see Carol at work on her favorite loom.